Message: "Double Network Detected: Core is connected to another device that is routing traffic"
This message indicates that you connected Norton Core to a combined modem and router or gateway device that should be configured in bridge mode. If you connect Norton Core to a modem and router combo, you create two home networks. Norton Core cannot protect the devices that are on the wireless network of the combo device. To fix this problem, configure the modem and router combo in bridge mode so that it works only as a modem. This way, Norton Core is the only router on your network and all of your connected devices are protected. Depending on your ISP and the router manufacturer, the steps to configure your gateway router in Bridge Mode may vary. AT&T no longer supports configuring the gateway modem or router into Bridge mode. To connect a third-party router behind the gateway modem, AT&T recommends configuring the gateway in IP Passthrough and DMZplus mode. For more information, see Configuring IP Passthrough and DMZplus. If you need more help, contact AT&T support. The instructions to configure your gateway router may vary depending on the make and model of the router. Visit the CenturyLink support page for the instructions specific to your router. Select your router manufacturer, and then select the model of the router that you use. On the Advanced or the Documents tab, locate and click the Transparent Bridging (RFC1483) link. 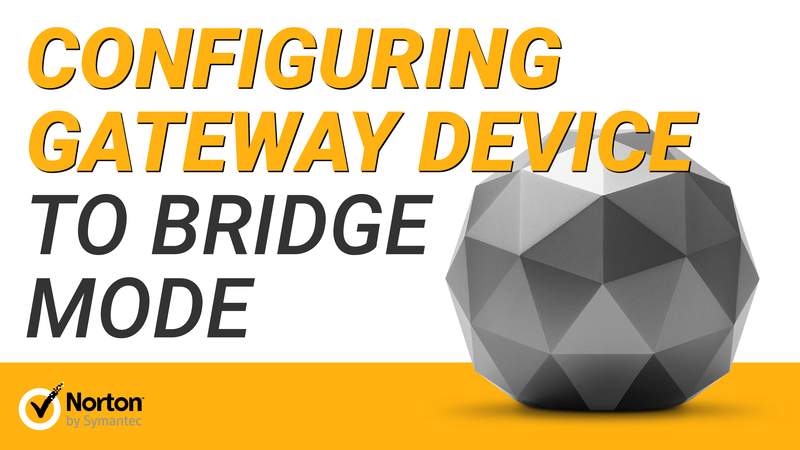 Follow the on-screen instructions to configure your gateway router in bridge mode. After you finish configuring your router, save the settings and restart your router. If you need more help with configuring your gateway router in bridge mode, contact CenturyLink support. For detailed instructions on how to configure your gateway router, read: Turn bridge mode on or off on your wireless gateway. Connect your Computer's LAN port to your gateway router's Ethernet port. You may also connect to your gateway over the wireless network. Make sure that the router is powered on. Type your username and password and sign in to your gateway router. To find your default username and password for the router, visit the Time Warner Cable support page. The options may vary depending on the brand and model of your router. Under LAN Settings, change the NAT mode to Bridged. Save the settings and restart the router. If you need more help with configuring your router, contact Time Warner Cable support. The instructions to configure your gateway may vary depending on the make and model of the router. Visit the Verizon support page for the instructions specific to your router. From the list of routers, select your router. Follow the on-screen instructions for your router to configure it in bridge mode. After you complete the configuration, save the settings and restart the router. For more help in configuring your gateway router in bridge mode, contact Verizon support. The instructions to configure your gateway may vary depending on the make and model of the router. Visit the EarthLink support page for the instructions specific to your router. For more help in configuring your gateway router in bridge mode, contact EarthLink support. The instructions to configure your gateway may vary depending on the make and model of the router. For detailed instructions, read: How do I set up my wireless cable modem? For more help in configuring your gateway router in bridge mode, contact Windstream support. For detailed instructions on how to configure your gateway router, watch: How to configure your Frontier Router for wireless. For more help in configuring your gateway router in bridge mode, contact Frontier Communications support. You may also connect to the gateway router over Wi-Fi. In your browser, go to the router configuration page by typing the IP address. Unless you changed it, your router uses the default password to sign in. If you don't remember the default password, please refer to the help documentation provided by the router manufacturer. Some of the routers also provide the ISP Protocol or Wireless Bridge options that need to be changed to Bridge Mode or Transparent Bridge Mode. For some of the routers, you also need to bind a specific LAN port of the gateway router to be used with Norton Core in Transparent Bridge mode. After configuring the settings, make sure you connect the WAN port of Norton Core to the correct LAN port of your gateway router. For more help with configuring your gateway router in bridge mode, contact your router manufacturer. Your modem and router combo device is now ready to use with Norton Core. Connect the WAN port of Norton Core to the LAN port of your modem and router combo(gateway router) using the Ethernet cable that is provided with the Norton Core package. If your ISP uses the National Broadband Network (NBN), and if you cannot configure the gateway in Bridge Mode, see Connect Norton Core to the ISP gateway or router that use National Broadband Network and VoIP for your home phone. If you use Telstra Frontier Gateway, then enabling Bridge Mode will disable the 4G backup connection as well. Connect your computer to the LAN port of your ISP's gateway. You may also connect your computer to the Wi-Fi network of the gateway. Type your username and password to sign in. You may find this information on a label below the gateway device. Go to Wi-Fi or Wireless settings, and turn off Wi-Fi. Go to Network settings and turn off NAT. Restart your gateway or router. For more help with configuring your gateway router, contact Telstra Support. Go to the Wi-Fi or Wireless settings, and turn off WiFi. For more help with configuring your gateway router, contact Optus Support. If you use Vodafone nbnTM, enabling Bridge Mode will disable the 4G backup connection as well. Type your username and password to sign in. You may find the login details printed on the Wi-Fi Reminder Card provided with the gateway router. You may also find your login details on the label underneath your Wi-Fi Hub. Go to the Wi-Fi or Wireless settings, and turn off Wi-Fi. For more help with configuring your gateway router, contact Vodafone nbn Support. Go to the Wi-Fi or Wireless settings and turn off Wi-Fi. For more help with configuring your gateway router, contact TPG Support. In the left pane, click Wizard. Set the connection type to Bridge, and complete the connection wizard. For more help with configuring your gateway router, contact iiNet support. Bridge Mode is only supported for VDSL and Fibre connections. Connect your laptop or computer to one of the LAN ports on the gateway router using an ethernet cable. You may also find your login details on the label underneath your gateway router. Edit the settings and select the Connection type as Bridged. For more help with configuring the gateway router, contact Spark support. Delete all the profiles except the connection you want (eg VDSL). Edit that profile, change connection type to Bridged, change Service type to Internet only. Go to Internet > Network security > Firewall. Go to Home Network > WLAN settings > WLAN Encryption. Uncheck the 2.4 & 5GHz WLAN SSID on the WLAN encryption section. Go to Home Network > LAN Interface. For more help with configuring your gateway router, contact Vodafone support. If your Internet Service Provider offers Voice over IP (VoIP), IPTV or other services, you may not be able to configure your modem/router combo into bridge mode. Please note that some modem and router combo devices do not support bridge mode configuration at all. Norton Core cannot monitor the network traffic and protect the devices that are connected to the model/router combo network. To protect these devices, you must connect them to the Norton Core network. Connect the WAN port of Norton Core to one of the LAN ports of your modem and router combo device. Turn off the Wi-Fi network on the modem and router combo device. If you cannot turn off Wi-Fi network, set up different network names for the modem and router combo and for Norton Core. Connect your devices only to the Norton Core network. To prevent automatic re-connection, make sure that you remove the modem and router combo network from the list of previously connected networks in the Wi-Fi settings on your devices. Even though this configuration relies on two routers, the security risks are minimized when you connect all your wired and wireless devices to the Norton Core.